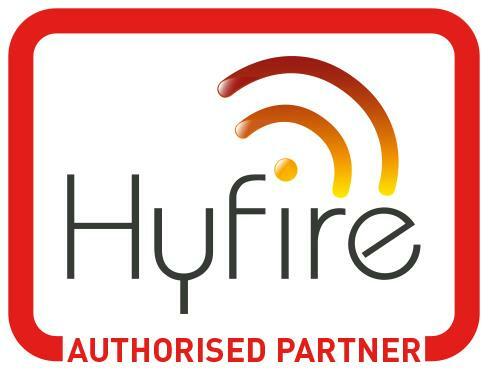 Hyfire is an intelligent wireless fire detection and alarm system providing the same high levels of reliability and safety provided by a wired system with the superior flexibility of wireless technology, giving excellent reliability and rapid installation with the minimum amount of disruption. Through its range of easily accessible, battery powered detectors, which communicate via a sophisticated wireless protocol, Hyfire offers high level protection with a bespoke finish making them less intrusive than other systems and therefore suitable in any setting. The batteries, which are low cost 3v lithium, are easy to acquire and replace and the power levels are continually monitored by the control panel, allowing you to plan replacement requirements. The detector range, which includes optical smoke, heat and multi-sensors all have adjustable sensitivity settings to suit any location. Optical smoke detector incorporates a double dust trap to protect the smoke chamber from airborne contamination along with a dust compensation algorithm. Multi-sensor is a combined optical and heat detector system that reliably determines the alarm status by analysing both the optical chamber and temperature sensor before activating the warning. Wireless alarm devices offer both audio, visual and combined units to provide a warning solution for any application and, as a market leader in fire protection, has been installed in many high profile locations, including Eton College and Claridges Hotel. When you choose Hyfire you can be assured that you are installing the very best fire protection for your premises. Call one of our friendly and knowledgeable team today to find out how Hyfire could benefit you.